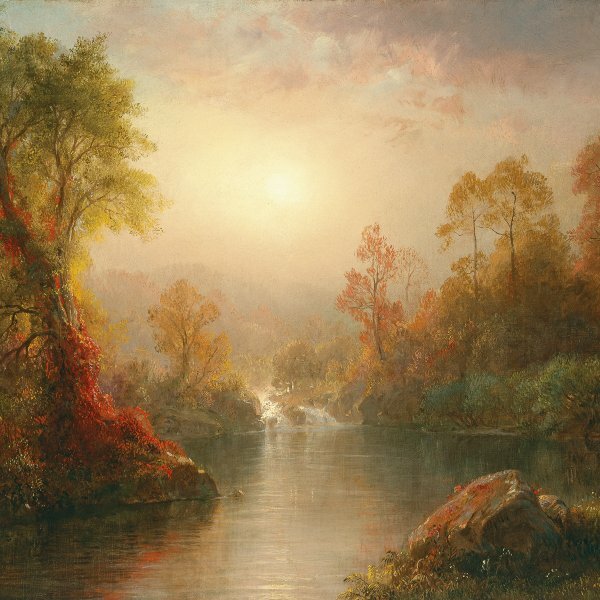 Throughout his career Frederic Edwin Church depicted the majestic, paradisiacal landscapes of the American continent. After the discovery and study of the area along the River Hudson, giving rise to the school of painting of that name with which Church was associated, he travelled in Europe and in South America. Cross in the Wilderness was commissioned by the family of William Harmon Brown following the death of one of his children and is inspired by the landscapes of Ecuador and Colombia. The cross with its garlands in the foreground evokes graveyards that Church would have encountered during his trips to these two countries. The painting’s spirituality is also expressed in the waterfall and peaceful waters of the lake, a symbol of purity and of the renewal of life. The water stretches away to the right of the cross, surrounded by an imposing rock formation. The painter sets the view as a whole under a vast, evening sky. 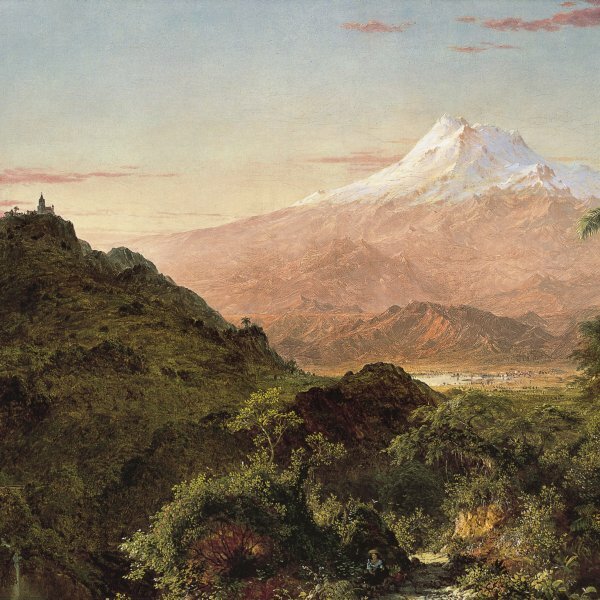 In the United States the dissemination of the writings of the German naturalist Alexander von Humboldt in the mid-nineteenth century aroused a growing interest in South America, to which the indefatigable adventurer Frederic Church travelled on two occasions. 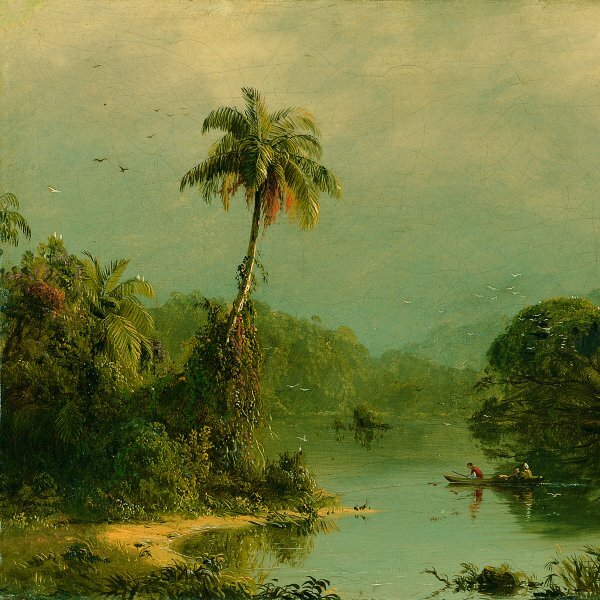 At the end of 1856 and during the first months of 1857, Church set about organising his second expedition to these remote lands while painting a series of pictures on tropical themes, including the South American Landscape in the Carmen Thyssen collection and Cross in the Wilderness belonging to the Museum’s permanent collection, executed a year later.Whereas in South American Landscape the foreground is occupied by dense vegetation and the Andean snowcovered tips of the Illiniza volcanoes — Cayambe and Cotopaxi — loom just behind it on a fairly close plane, here the peaks can only be made out in the distance and there is hardly any sign of vegetation. In the foreground we find a dark rocky formation to the right of the landscape where a cascade falls into a pool similar to the one on the right side of South American Landscape. 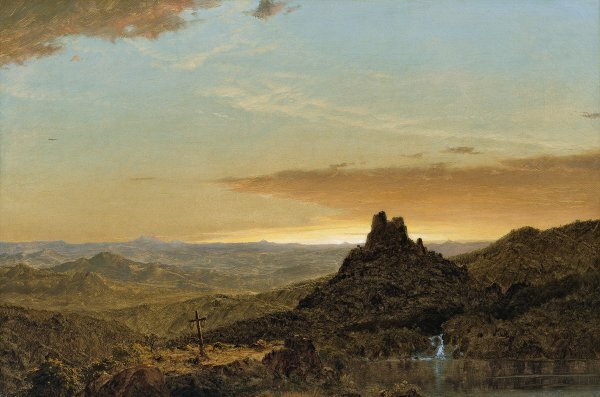 What is more, the presence in both paintings of a church perched high up the mountain and a cross in the foreground appears to hint at a Christian symbolism which, in the case of Cross in the Wilderness, suggests an allusion to death.